Public concern over the Manolis L. issue has been rising in Newfoundland. The concencus is that inaction towards the 500 tonnes of oil contained with the Manolis L.’s hull could have a devastating effect on Twillingate’s lifelines- tourism and fishing. Of course, it is also well understood that the impact would spread much further than the shores of just Twillingate and likely have a variety of unanticipated consequences. Interest in the Rock Vandals ‘Old Manolis and the Sea‘ project has also been on the rise, the draw being the gentle form of activism it utilizes, craftivism. Craftivism promotes an alternate approach to activism, one that uses craft to draw attention to a range of social and political issues, issues that are often considered impolite or difficult to discuss around the dinner table. In the case of the Manolis L., the clicking of knitting needles replaces pickets and angry shouts of injustice. Political engagement in local issues is top priority for some, yet most citizens do not feel called to participate, often citing feelings of exclusion or inferiority. As craft is a very familiar medium it is also inherently accessible and inviting, thus revealing the deep beauty of Craftivism. Craftivism has been used to raise awareness of a variety of issues, like labour rights of marginalized workers in garment and fashion industries, the inequalities underlying the Occupy movement and messages related to war and violence. As craft is considered inherently non threatening and acts of craftivism are typically presented in non-aggressive ways, the message is received in much the same manner. Additionally, craftivism pairs well with social media; images are able to convey deeper issues while travelling from living room to living room with ease thereby drawing added attention. For a quick, thoughtful lecture on craftivism you could do no better than to plug into Sarah Corbett, founder of the Craftivist Collective. Reception towards ‘Old Manolis and the Sea’ has been incredibly warm and the number of starfish soon to grace to the streets of Twillingate continues to grow. Knitters from as far away as the mainland are getting involved, with many knitters identifying their work as their initiation into activism. Craftivism promotes meaningful action from all stripes and is often described as an act of love or quiet shouting. 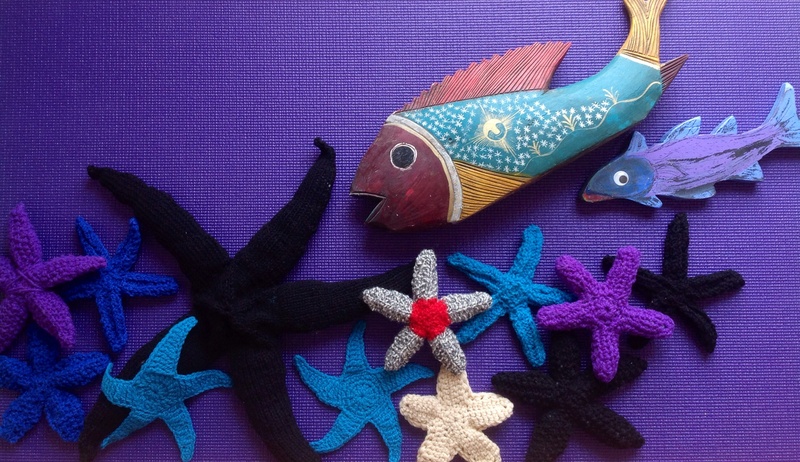 Sarah Corbett believes that craftivism can be used as a gift to promote understanding between activists and policy makers, thus suggesting that knitted starfish could influence the psyche of those beyond Twillingate’s shores, those with influence over decisions related to its well-being, if ‘present’ed well. Old Manolis and the Sea will go up on June 8th, World Ocean Day, so keep calm and keep knitting, and be sure to get your starfish to a Rock Vandal the week before. The perfect location has been chosen and the scene was set long, long ago. If you live in Twilly keep an eye out for the starfish invasion somewhere near the ocean and a public path, and if not, you can be sure to get the latest update by sticking close to rockvandals.com.